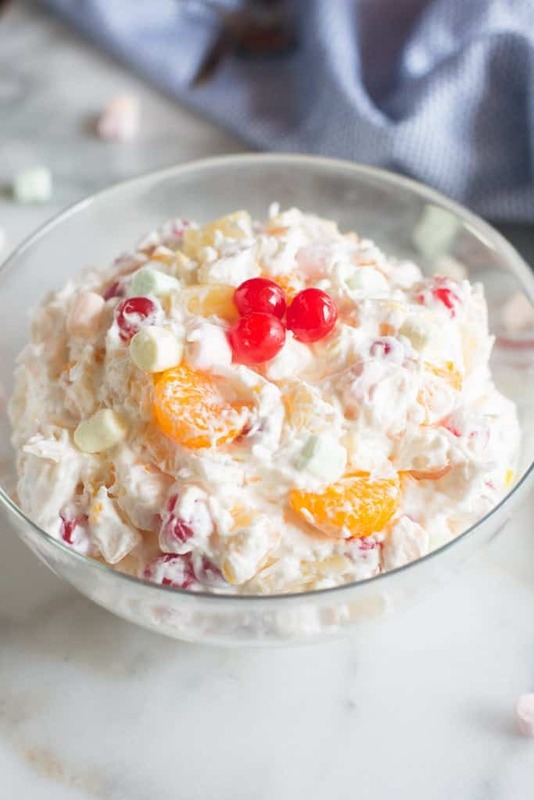 I love the tropical sweetness of this “fluffy” Ambrosia Fruit Salad. This easy side dish is always a crowd favorite! My family always gets excited when I break out the mini marshmallows to make a “fluffy salad” side dish. You know, those salads that taste like dessert but can pass for a side, especially on holidays? There’s this delicious cranberry fluff salad that we serve at Thanksgiving and Christmas, and this “frog eye” acini de pepe fruit salad that we love at any family party. 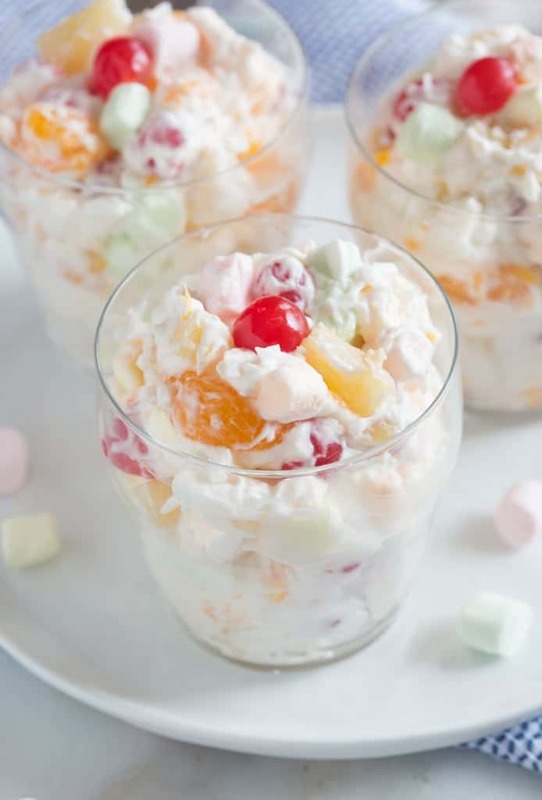 Do you have a favorite fluffy fruit salad? 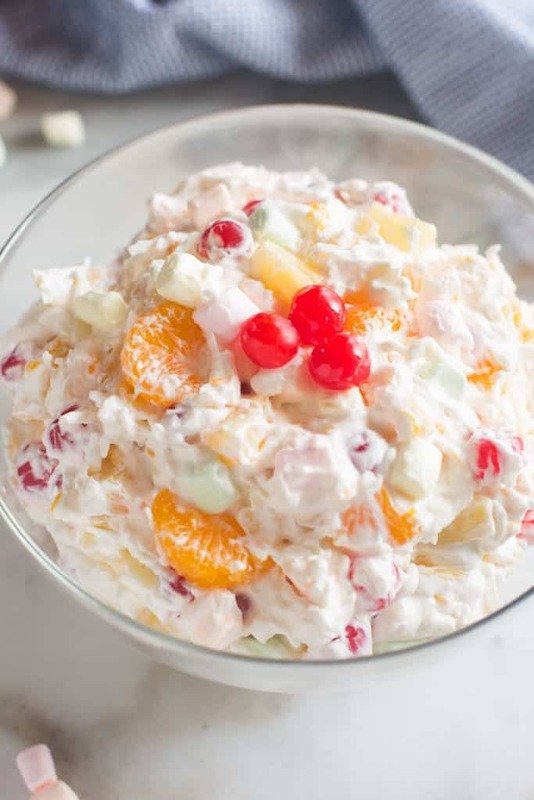 I particularly love ambrosia fruit salad at Easter time. The soft pastel colors remind me of the season. 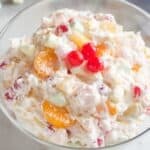 Many recipes for ambrosia salad use cool whip, but if you’ve followed my blog at all, you know I would never use cool whip when I could substitute fresh whipped cream. The taste is so much better! I love the flavors from the sweetened whipped cream, coconut, yogurt and tropical fruits. And who can resist the colorful mini marshmallows? YUM! This salad is always a crowd pleaser. 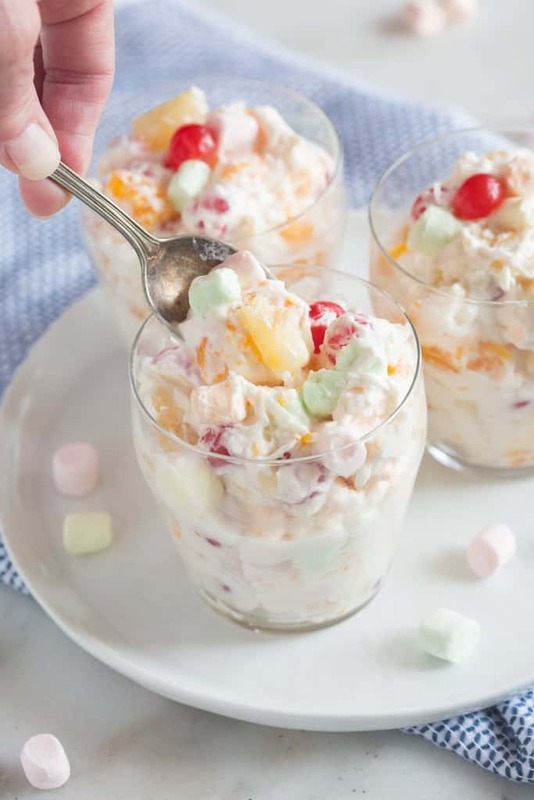 I love the tropical sweetness of this "fluffy" Ambrosia Fruit Salad. This easy side dish is always a crowd favorite! Add whipping cream to a large bowl or stand mixer and beat with electric beaters for 1-2 minutes. Slowly add powdered sugar and continue beating until stiff peaks form. Fold in yogurt. Fold in remaining ingredients (make sure the canned fruits are very well drained). If making several hours or a day in advance, leave the marshmallows out and stir them in just before serving. I loved this recipe growing up but have struggled to find a great recipe since I lost ours. I stumbled upon this one and it is a keeper for sure! Will be making regularly at holiday parties. You need to put the fruit and all the juices over the mini marshmallows. Then put that in the refrigerator for 24 hours. The salad is called 24 hour salad. Take that out of the refrigerator and fold in the whipped cream. Return to the refrigerator for a chill. Serve.